A Baby Buddy Best Seller! Babies and moms will love our premium quality, natural sea wool sponge, specially selected and sized for baby. Super absorbent and unbelievably soft, this sponge produces a great lather and makes rinsing baby quick and easy. Natural sponges are more resistant to bacteria than synthetic sponges. All natural, recyclable and renewable. MADE IN USA. 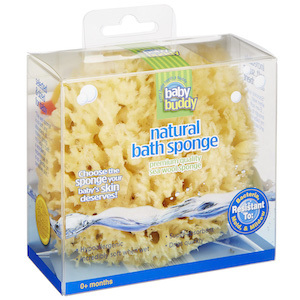 Click here to learn how to clean and care for your Natural Bath Sponge.